What's the US Weather Like for the Super Blue Blood Moon? 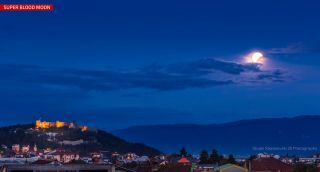 Astrophotographer Stojan Stojanovski sent in a photo of the "blood moon" supermoon lunar eclipse taken in Ohrid, Macedonia. Here, the partially eclipsed moon peeks through clouds. A lunar eclipse will come to the skies early tomorrow morning (Jan. 31). So, here's the big question: Will you be able to see it? About two-thirds of the United States — including the East, South and Southwest — will have generally fair skies on Wednesday morning, allowing for a view of the lunar eclipse as long as the moon is in the sky. Meanwhile, cloud cover — chiefly over the north-central states as well as parts of the Far West — may hide the shady lunar drama. The latest weather outlook indicates that a ridge of high pressure extending from Quebec, Canada, south to the Gulf Coast should bring mainly clear skies for New England, New York, the mid-Atlantic, Piedmont and Southeast coast, including Florida. All of these regions will be able to catch only the opening partial stages before the moon sets, effectively ending the show. Clear skies should also prevail over the Deep South, Texas, Oklahoma, the Southwest desert, the southern and central Rockies, and California. Unfortunately, the weather will become problematic over the nation's midsection, thanks chiefly to a rather intense storm centered over western Ontario. That system will cause a rather strong and gusty south-southwest wind, which will send a flow of mild air over a zone of colder air — a process known as overrunning. This, in turn, should induce a broad swath of high- to mid-level cloudiness over parts of the northern and central Great Plains, as well as much of the Great Lakes. For most places, these clouds will not be completely opaque, and the moon may actually manage to shine through. However, it likely will appear rather fuzzy and hazy. The thickest clouds will be present over parts of Minnesota, Wisconsin and northern Michigan. In fact, over Michigan's Upper Peninsula, several inches of snow could fall. The eastern, southern and southwestern United States should have clear skies for the Super Blue Blood Moon on Jan. 31, but viewing conditions will be worse farther north. Across the rest of the United States — including the Pacific Northwest, northern Rockies and western Great Plains — local eclipse visibility will be determined by the position of an Arctic cold front draped across the Plains states, which will likely trigger its share of cloudiness as well as precipitation, especially over higher-terrain areas. Snow appears to be a good bet over the Cascade Range in Washington, Clearwater Mountains of northern Idaho and possibly the Absaroka Range of northwest Wyoming. And yet, in spite of this relatively pessimistic weather outlook, there will also be locales where broken to scattered cloudiness might allow for periodic views of the totally eclipsed moon. Even if the weather starts off cloudy, there is always a chance that it will clear enough for some glimpses of the spectacle. To get a better idea of where the clearest skies may be, go to nws.noaa.gov/organization.php, where you will find links to over 100 National Weather Service forecast offices for all 50 states, as well as Puerto Rico, Guam and American Samoa. And one final bit of advice: In many parts of the country, near- or below-freezing temperatures will predominate (it is, after all, still January), so make sure to bundle up. Good luck, and may you have clear skies!